I only know there's a road salt shortage in Ontario because of where my husband works and the fact that I am the V.P. of my condo board. You know why there's a shortage? Probably because it's all at the Oshawa GO Station. The platform is outrageously over-salted. Salting should only happen if there's a threat of ice. It's been pretty damn dry since Monday. But there's a reason why it's there. Oh I get the whole liability thing and so out of fear, corporations and businesses salt over salt. It's this same fear that has forced several landscaping and snow clearing businesses into bankruptcy this winter. Many could not keep up with the demands of the "weather", and the threats of liability claims, so they shut their doors. I was at the Crappy Tire by the Oshawa Centre the other weekend, and they had BAGS of this stuff just sitting around. On a side note: it isn't so much the new stuff coming down, but the PILES that are still melting just a little bit because of the sun. I just wish people in my neighbourhood would deal with their sidewalks as it is safer to walk in the road. Oh my heck! I'm the V.P. of my condo board! I can soooo relate. Our contract has salt included in the price but our guy has been mixing a lot of sand in with what he's put down. Been a rough year for salting. But I think Whitby GO out-salts everyone. There were piles of it outside the parking garage yesterday morning. Saltgate is not confined to Oshawa, or Whitby. Guildwood has a 1/2" layer as well. I remember catching the train at Bramalea years ago and it was like this all winter too. GO is definitely wasting salt, which has to be a product of fear of lawsuits. There is NO need for that much salt. Yep, screw the environment... it's all about the FEAR. I might be crazy, but my mother had me tested . 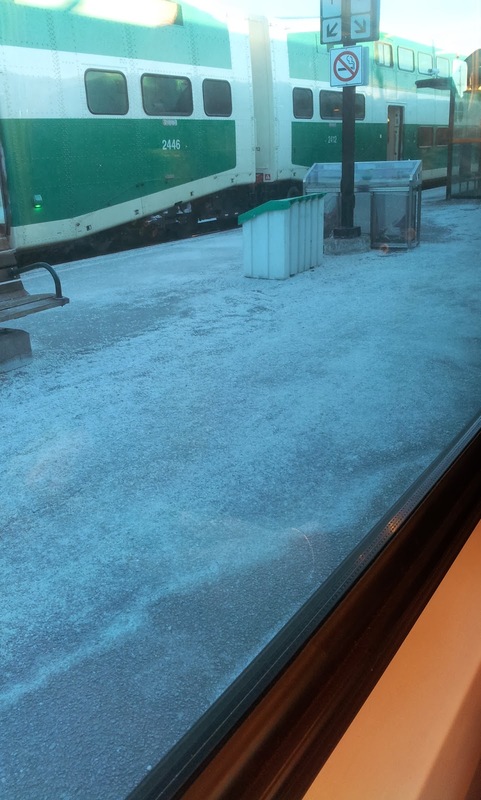 . . didn't GO Transit say last year that they heard us on the over-salting issue? Does anyone else remember that? you can do a "soft shoe" dance at Union! Probably, April. It does sound familiar. And they probably did start out easy on the salt. But then those ice storms hit and the continued nasty weather happened. And this is what happens. It is odd at Ajax: some parts are sheer white, as far as the eye can see. Then you hit the new part of the platform and the melt system kicks in and watch the steam float gently upward. Parking lots are way over-salted too. Pretty sad that there's no snow on the ground yet still can't see the parking space lines! I'm willing to bet if GO was more diligent on their use of salt, our fare increase could have been cut in half. And don't even get me started on the detriment to the environment. All that salt ends up in our lakes and rivers. EXACTLY!!!! BUT OH MY GOD WHAT IF SOMEONE SUES!!! So crazy... BUY boots you JERKS. The number of people I see running down the platforms in high heels (shoes and boots) when it is snowing is amazing. Stupid people. Squiggles, I don't think the ice storm is to blame. While we may have had more snow this year than we typically do, that only explains the salt on the days when there is bad weather. That doesn't explain why there was fresh salt out there today. And I don't think law suits are the problem, just the pure stupidity of GO Transit. I fell getting on the train once and ended up with celulitis in my leg from the wound and it took three courses of antibiotics to clear it up. It was raining and that little metal step you use to get on the train was and slippery. I complained to GO and suggested that they should put some of that no slip stuff that you can put on stairs on those little steps before someone got seriously hurt. They sent me a voucher for my fare and did nothing with the steps. Pickering has been the same for years... a thick coat of white salt on the platform, long before the ice storm. It's ridiculous! Mark my words, if Metrolinx even considers nominating GO Transit as a contender for ANY KIND of ENVIRONMENTAL award relating to transit, IMMA SHUT IT DOWN.